Beagle Welcome Stake. Our Beagle Welcome Stake features a hand painted resin Beagle based on an original carving of your favorite dog breed - the Beagle. 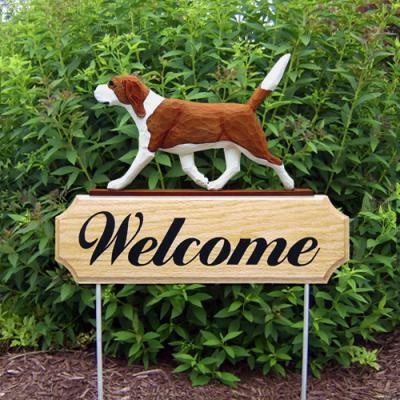 The Beagle Dog in Gait 2 dimensional figure is mounted on a solid oak sign - the dog measures approximately 11 1/2" in length depending on breed and the wooden sign measures 4 1/2" x 15". Two aluminum rods measure 1/4" x 16" each in length. Suitable for outdoor display. Replace the word "Welcome" and personalize with your name, Kennel Name or House Number. Up to 17 Characters. A space is considered a character. Made in the USA.